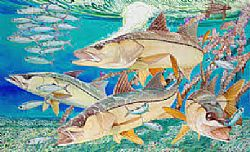 Sarasota anglers: Your knowledge can help our fisheries thrive. Join local researchers for the 15th meeting of the Sarasota Bay Fisheries Forum — an independent, community discussion to help inform fisheries management and science. Mote Marine Laboratory Buchanan Room* (3rd floor): Park in Mote Aquarium’s parking lot and enter through the main Lab Research entrance down the sidewalk immediately left of the Aquarium entrance. This month's speaker is Dave Blewett. Blewett is a fisheries researcher with FWC who is translating his knowledge of estuarine fishes from natural areas into the altered landscapes of Florida’s creeks, canals, and ponds. He will share professional insights into how fish populations could potentially be increased by better designs and management of systems that were originally designed for drainage, navigation, or other purposes. He points out specific, key elements found in nature that are occasionally created by chance within our engineered aquatic systems. For example, a key element of habitat for juvenile sport fish can include restricted passageways to nursery grounds that exclude large predators, while for larger adult sport fish it can be pulsed seasonal prey coming from productive floodplains or wetlands. Mr. Blewett is optimistic about opportunities for improving Florida’s urban estuarine fisheries.